Pears are one of the oldest fruits cultivated by man. They are believed to have originated in China and be native to Europe, North Africa and Asia. There is evidence of these fruits being consumed since prehistoric times. Famous author of The Odyssey, Homer, called pears “gift of gods.” The Chinese even believed that the pear was a symbol of immortality. “Pears have been used as a traditional folk remedy in China for more than 2000 years because of their reported anti-inflammatory, antihyperglycemic, and diuretic activities. Other traditional uses of pears include use as remedies for alcohol hangovers, to relieve cough, and constipation,” reports the National Institutes of Health (NIH). Commercial pear production mainly takes place in the Northwest United States. Reportedly, 75% of the U.S.’s supply comes from Washington, Oregon and California. There are about 3,000 varieties of pears in the world, but only about 100 varieties are grown commercially. There are 10 basic pear varieties available in the U.S. Some common types are Green Anjou, Red Anjou, Bartlett, Red Bartlett, Bosc, Comice and Asian Pears. And since some of these varieties have overlapping seasons of availability, you can pretty much eat pears year-round. And you may want to eat them all year, considering the potential health benefits. These fruits are sweet, crisp, delicious and cholesterol-free. Pears are full of powerful antioxidants. Pears contain several antioxidants. Antioxidants help protect the body from oxidative stress, which can lead to chronic inflammation. Inflammation is believed to be a major contributor to several diseases, including cancer, dementia, diabetes, heart disease and more. Some of the antioxidants in pears are called cinnamic acids. These acids may inhibit cell growth of cancer, including cancer of the skin, brain, prostate and lung. In addition to this, the hydroxycinnamic and hydroxybenzoic acid content in pears is linked to stomach and lung cancer prevention. Pears are also rich in the antioxidant glutathione which may help protect you from cancer, high blood pressure and stroke. Pears may help with bone strength. Pears contain boron. You may have never heard of it, but boron is a trace mineral that helps build strong bones and helps the body metabolize calcium. “Boron plays an important role in osteogenesis, and its deficiency has been shown to adversely impact bone development and regeneration,” according to the National Institutes of Health (NIH). Pears may help keep your gut and digestive system in check...in so many ways! Pears are rich in both insoluble (about 71%) and soluble fiber (about 29%). Insoluble fiber cannot be digested by the body, so it helps add bulk to the stool and remove waste and toxins from the body. This may help better protect you from colorectal cancer. Soluble fiber attracts water in the body and turns into gel during digestion. Much of the fiber in pears comes in the form of pectin, which is a starch that occurs naturally in the cell walls of some fruits and vegetables. Pectin is a natural diuretic, meaning it may help prevent water retention and bloat. It may also help prevent diarrhea (added bonus is pectin may also help reduce cholesterol and decrease the risk of heart disease). Pears also contain prebiotic fiber that helps promote intestinal health by providing food for beneficial probiotic bacteria. One study suggested that when pears are digested, they slow the growth of harmful bacteria that may cause stomach ulcers and gastritis. This ulcer-causing bacteria is called H. pylori and is the most common chronic bacterial infection in humans. Pears may be sweet and delicious, but they may help fight diabetes. Pears are rich in anthocyanins, which are antioxidants found in plant foods that give these foods their beautiful hues and vibrant colors. “Consumption of anthocyanin-rich foods, particularly blueberries and apples/pears, was associated with a lower risk of type 2 diabetes,” reports the NIH. The fiber content in pears is also key in managing diabetes. 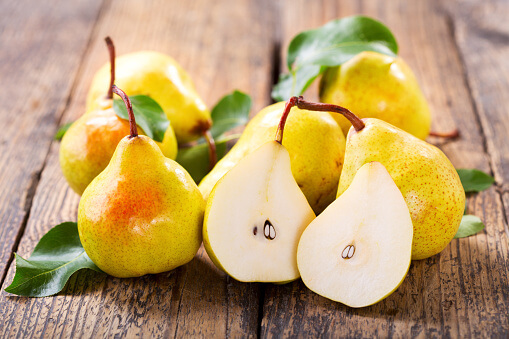 The soluble fiber in pears can help slow the absorption of sugar and control blood sugar levels. Pears may help you avoid the dreaded hangover. There are also animal studies with pears that suggest that pears may regulate alcohol metabolism. And as you probably have guessed, pears are chock-full of nutrients. Here is some of the vitamin and mineral content in one large Red Anjou pear. Calcium, 25 mg. Of course, calcium is important for building and maintaining strong bones and teeth. This mineral is also important for maintaining hair and nail health in perimenopausal and menopausal women. Adequate calcium intake may also decrease your risk for colorectal cancer. Phosphorus, 29 mg. Adults 19 and older usually need about 700 mg. of phosphorus daily. This mineral often does not get the credit it deserves, but it does so much for your body. Phosphorus is almost as abundant in your body as calcium and helps calcium build strong bones and teeth. Phosphorus is also important for how your body stores and uses energy, repairs cells and is needed to make proteins like the one responsible for the oxygen-carrying capabilities of our red blood cells. Potassium, 274 mg. Adults generally need about 4700 -5100 mg. of this must-have mineral daily. It helps keep blood pressure under control, may help reduce kidney stones and may prevent bone loss as you age. According to the National Institutes of Health (NIH), potassium may help reduce osteoporosis and prevent heart failure. Vitamin C, 11.6 mg. You likely know about the immune-boosting benefits of vitamin C, but what about this nutrient’s importance regarding aging? Folate, 16 mcg. Folate (also called vitamin B9) is a very important nutrient, especially for pregnant women. Folate may also help prevent cancer and heart disease and improve mental health. A study from Harvard Health reported folate may also be useful in treating symptoms of depression. Choline, 11.4 mg. Choline helps your liver, brain, muscles, nervous system and overall metabolism function. Vitamin A, 54 IU. This vitamin is an antioxidant that supports the immune system and is good for skin and eye health. Vitamin A also promotes cell growth. Vitamin K, 10.9 mcg. This vitamin is very important, as it helps regulate normal blood clotting. It also helps to transport calcium throughout the body, so it is very important for bone health. Remember to eat the skin of the pear too. If you don’t, you will miss out on a lot of the vitamin and mineral content. There are apparently no significant downsides to eating pears, even for pregnant women. But just because a food is healthy, does not mean that moderation goes out the window. If you are taking medications, prescription and over-the-counter, talk to your doctor about including pears in your diet. Sometimes eating fruit can alter drug-metabolizing systems in the body, and you always want to avoid drug interactions so that you will be healthy and your medication will work as effectively as possible.